More prizes keep rolling in for the Alaska Summer Showcase, on Sat., Mar. 30, 2019 at the Alaska Native Heritage Center (12-4PM). YES, it’s time to JUMP-START your summer. Visit with the state’s top travel companies and plan out some great adventures. Then, you could WIN at trip, too! ALASKA AIRLINES trip for two anywhere they fly! KNIK GLACIER helicopter tour (above) for two from Anchorage Helicopter Tours. This includes a glacier landing! CAMPERVAN RENTAL for three days/two nights from Get Lost Travel Vans. Britta will have one of her vans ON DISPLAY! KENAI FJORDS NATIONAL PARK CRUISE for two, plus overnight accommodations at the Seward Windsong Lodge from Kenai Fjords Tours! Ravn Alaska: Trip for two anywhere on their system, including their new destinations: King Salmon and Dillingham! Phillips Cruises: Sunset sail for two on the Klondike Express in College Fjord. Major Marine Tours: A special “Orca Quest” scenic cruise in Seward to find the Orca Killer Whales….plus overnight accommodations at the Harbor 360 Hotel! Live music by Todd Grebe & Cold Country. Todd and his group have played for us before…they do a g-r-e-a-t job! Also, we’ll have a SPECIAL presentation by the Alaska Native Heritage Center Dancers! Come for the prizes—and stay for the FOOD TRUCKS! Now for the quiz: Are you 18+? Do you want to jump-start your summer? Then click the button and buy your tickets! Join us at the Alaska Native Heritage Center on Sat., Mar. 31, 2018 for the fifth annual Alaska Summer Showcase! This is the perfect place to jump-start your summer. Visit with Alaska’s best travel companies–and check out the show-only specials. -Round-trip for two from Anchorage to Frankfurt on Condor German Airlines! -Round-trip for two on Alaska Airlines. -Round-trip for two from Anchorage to Russia’s Kamchatka Peninsula with Yakutia Air. Listen to great music from Todd Grebe and Cold Country…and enjoy a special presentation from the Alaska Native Heritage Center dancers!! YES, there will be food trucks. YES, we have a special “presentation by the Alaska Native Heritage Center Dancers! See you there! First, you need your TICKET. Get one HERE. Next, pick up your PASSPORT (pictured, above) at check-in. That starts at 12 Noon on Saturday! Visit the best travel companies in the state. It’s easy, since they’re all assembled RIGHT THERE at the Alaska Native Heritage Center. After it’s all filled out–put your name in the hat for more than $20,000 in travel prizes! To win the trip for two on Alaska Airlines, you MUST be present to win when we draw at 4:00pm. Bring your sense of adventure, along with your appetite, since we’ll have a FOOD TRUCK RODEO! Here’s the thing: prizes and surprises keep coming in for this year’s Alaska Summer Showcase. THIS JUST IN: Trip for two on a Denali Heli-hiking adventure from our friends at Era Flightseeing! You’ll fly in this helicopter (above) up to a scenic ridge for a special adventure with an expert naturalist. I’ve done it. FUN! It’s just one of the prizes at this year’s Alaska Summer Showcase on Mar. 26! Don’t miss it! Oh…in the food truck rodeo: Tiki Pete’s Alaskan Dogs (above). Hot dogs, sausages, Chili Dogs, Mac + cheese dogs…the works. Don’t miss it! KOAN, KNIK and MOVIN’ 105: Our awesome media sponsors! LISTEN UP! Our media sponsors at HOT TALK KOAN (1080AM, 95.1FM), KNIK “Smooth Jazz” 87.7FM and MOVIN’ 105.7FM are making some BIG NOISE about the Alaska Summer Showcase…, We Love You, Yeah Yeah Yeah! Massive prize list for the Alaska Summer Showcase!! $20,000+ in Alaska travel prizes! We’re giving it ALL away on Sat., Mar. 26 at the Alaska Native Heritage Center! Which prize do YOU want? 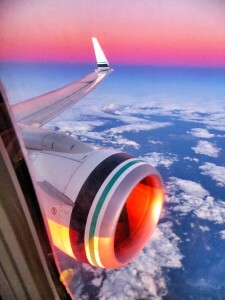 Alaska Airlines: Systemwide tickets for TWO! MUST be present to win (we will draw this prize at 4:00pm on Sat., Mar. 26, 2016 at the Alaska Native Heritage Center). Alyeska Resort: Overnight accommodations and a 26 Glaciers Cruise from Whittier! Chena Hot Springs Resort: Overnight accommodations, plus admission to the Aurora Ice Museum and a swim pass to the hot springs! Alaska Denali Travel: Denali Backcountry Adventure for two from the Park Entrance to Kantishna, plus dinner. Harbor 360 Hotel: Overnight accommodations in Seward, plus National Park cruise into Kenai Fjords National Park from Major Marine Tours. K2 Aviation: Flightseeing trip for two from Talkeetna. Kennicott Glacier Ldoge: Two nights accommodations, including meals. Knik River Lodge: Helicopter flightseeing tour for two over Knik Glacier, including glacier landing. Land’s End Resort: Three-day/two-night Getaway package wtih dinner for two. Ravn Alaska: Two tickets, systemwide. Northern Alaska Tour Company: Arctic Circle fly/drive for two. Era Flightseeing: Denali heli-hike tour for two! …and more! Don’t miss it. Buy your tickets in advance at EVENTBRITE and save! Make plans now to attend this year’s Alaska Summer Showcase on Sat., Mar. 26, 2016. We’re adding more prizes and more fun for everyone! Bring the kids. If they are age 12 and under, they get in FREE. Plus, in conjunction with our hosts at the Alaska Native Heritage Center, we’ve got a special “Kids Zone.” Fun games, crafts and activities! Win a helicopter trip for two over the Knik Glacier (with glacier landing!) from our friends at Knik River Lodge. It’s just 54 miles from Anchorage…and a world away! The Alaska Native Heritage Center Dancers will be back again for a special appearance. We’ve got them scheduled for 2:00pm! Don’t miss it. Win a three-day/two night stay at Kennicott Glacier Lodge, in the heart of Wrangell-St. Elias National Park. This prize includes MEALS at the lodge. We love this place–you will, too! Our Master of Ceremonies? The oh-so-famous and entertaining James Gaddis of KTVA News (pictured, left, with the lovely, talented Megan Mazurek of KTVA). We’ve traveled together around the state, but there’s more that he and his crew want to see…let’s help him jump-start HIS summer, too! Win an overnight stay at Chena Hot Springs Resort near Fairbanks, including admission to the Aurora Ice Museum. Don’t miss your chance to have an “Appletini” at the Ice Bar. Oh…that’s extra. But you’ll want to get one–and get your picture taken. FUN! Then, go soak in the hot springs! Win a trip NORTH of the Arctic Circle from our friends at Northern Alaska Tour Company in Fairbanks. You’ll drive up, crossing the Yukon River and the Arctic Circle…in the shadow of the Trans-Alaska Pipeline. After exploring Coldfoot and neighboring Wiseman, you can FLY back. It’s a fun trip…I’ve done it!! While you’re scooping up the info you’ll need to make the most of your great Alaska summer (including a 50 percent discount on the Alaska TourSaver 2-for-1 book!!!!! ), enjoy the Alaska-grown music of the Hannah Yoter Band. We love them. You will, too. GET YOUR TICKETS HERE and JUMP-START your SUMMER! You can, of course, get your tickets at the door on the morning of Sat., Mar. 26. It just costs a little more ($10 for grown-ups, kids 12 and under, FREE). We’re proud to welcome the American Cancer Society as our nonprofit sponsor for the Alaska Summer Showcase. The American Cancer Society is the official sponsor of BIRTHDAYS!